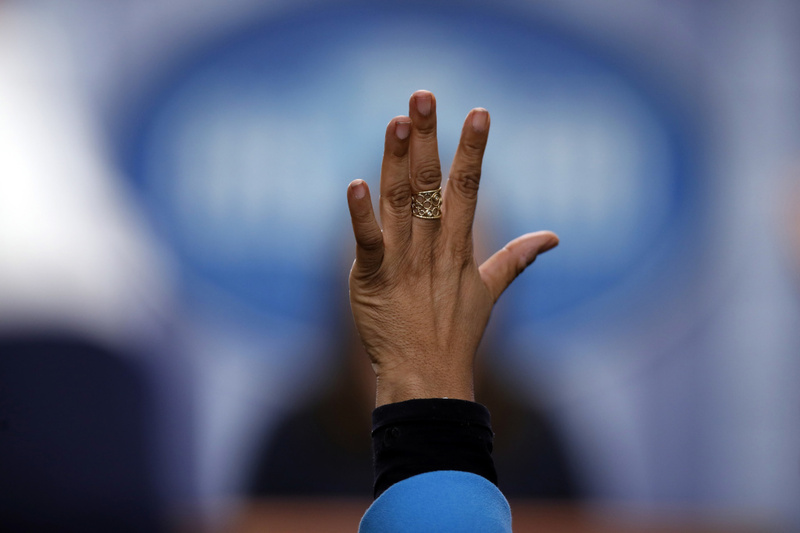 Reporter April Ryan raises her hand during a press briefing at the White House in 2017. Her pointed questioning has often earned her the ire of the Trump administration's communications team, as she writes in Under Fire. "It was nerve-wracking," she says. "My ears were hot. It's like all the blood runs to my ears. And it feels like you just lose yourself. I mean, think about it — the world is watching you, and they are scrutinizing what you're asking. And you can get lost in that moment. Even though you're professional, that is still the White House, 1600 Pennsylvania Avenue. Think about it — everything comes to that White House, from war to peace and everything in between." Today, April Ryan's nerves have hardened. She is one of the most recognized faces at press briefings. She's one of the few black reporters covering the White House. And she has made her mark with her unflinching questions — especially on issues of race. In her new book Under Fire: Reporting from the Front Lines of the Trump White House, April Ryan writes about how and why she has also come to be known for tangling with the Trump administration's communications team. NPR's requests for comment from the White House and former press secretary Sean Spicer were not returned as of the first airing of this interview. Ryan: I hate listening to those tapes. ... You're in there making a moment in time that you're not supposed to make. You're there to ask a question, not to be the meme of the day, or the conversation — the watercooler conversation. Like, what did I do? Cornish: That happened many times over the last couple of months. And did you have a moment where you felt that you didn't want to go back — that you maybe wanted another beat? Ryan: Oh yeah. That day was one of the worst days. I couldn't focus. It took me a longer time to do my job than what I normally do. And so I remember driving home, teary-eyed but not crying. I was like: What am I going to do now? I'm going to leave this place. And I was really trying to figure out my life — sustaining my life with my children — I'm a divorced mother. This is real. This is not a joke; this is not a farce. This is my life. I have asked each administration the same questions except for one: "Mr. President, are you a racist?" ... to President Trump. It was so much that happened that day. And the only reason why I asked because we had the s-hole comment, we've had Charlottesville, we've had the Frederica Wilson stuff; we've had so much stuff going on. There are multiple issues that are on the table that many African Americans — a part of this nation — are concerned about. And that — I understand that this administration is still feeling the sting of that, and that's why I'm considered on this blacklist that they have. But I looked back and I talked to some people from various organizations. And they said: April, you're an equal opportunity offender. I said: What do you mean by that? They said: Remember, the NAACP was upset with you because you were breaking news about them. I said: That's true. They said: Remember, the Congressional Black Caucus was upset with you at one point because you kept asking questions that they didn't want to answer. I said: That's true. The Clinton administration was angry with me at one point about asking questions — I would always ask, you know, "Are you going to apologize for slavery?" They hated that. George W. Bush's administration was angry at me. Barack Obama's administration was angry. So this is not new — but this administration doesn't like it. Ryan: Point of no return ... I mean, some days she doesn't even want to give me eye contact, but she can't. I am in her line of sight, third row, smack dab in the middle. I don't communicate with them any more beyond the briefing room. I don't go upstairs to see them — I haven't for a long time. You know, during that time that we had that dinner, it was an earnest – I believe both of us wanted to mend fences. I do believe that. But how am I going to mend fences with you when you continually [are] just diminishing me or trying to discredit me? I'm a woman like you are, with children. Cornish: But what does this say about once things become personal, right? That, what does that mean for your ability to do your job? Ryan: For the longest time, I kept trying not to make it personal. But it's personal. They are attacking me. They meant to kill my career. They have gone after me. But what I can say is: I can still go in that room and ask a question. I have a job to do. The job is bigger than this. It's a sad point. There are people out here who really are concerned with my safety, and there are people out here [who] really could care less about my safety. I don't like talking about it anymore, but it's real, and it's a turning point. And it's not just me. We're hearing it on C-SPAN. We're hearing it on voice messages to other journalists. We're seeing it. I don't know; it's a sad peace. All I will say is: There's collateral damage that these kind of things have on a person and those who are around them, and you have to change your life. Noah Caldwell and Emily Kopp produced and edited this interview for broadcast. Patrick Jarenwattananon adapted it for the Web.